you leave on for about 10min but I leave it on maybe around 15 min, the mask is super wet and have excess liquid in it so it drenches your skin really well so that's why I leave on for more time hehe :D after the mask simply pat your face till it feels like your mask have fully absorbed into the skin. I feel like my skin is so much softer after the mask and wake up to really smooth skin. Thanks for the review!! You look gorgeous and kawaii today (as usual!). commenting on your portfolio. I know a little something about design. I would make the "resume, beauty, etc" text hoverable/clickable. I find it slightly frustrating that only the letter in the circle is clickable. Also, you may want to redo the photo section under "beauty and fx" so visitors can easily browse through your photos. If one had never used itunes before, it may be confusing. That is maybe your most important part of the website (showing off your great skills), and it is hard to view it all. You could keep that feature, but have a another page with the photos laid out gallery style when the user clicks on "weddings" or "photoshoots" for example. Otherwise, everything is cute! Good job! You know what's weird? 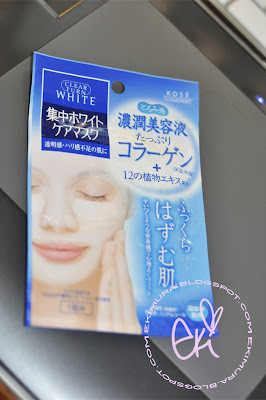 I saw that nive has some similar sheet masks, but when I went to the store there were none! And I realized that they're made just for the asian market :((. I want to try one soooo badly bah! Btw this is a great review! Thanks! WOW! you look very pretty! I want to try this mask out now. Where can you purchase this mask at? nice review! i was thinking should i get this mask the other day..i must not! since its super wet! you hav beautiful skin already..
Eki dear, the white headband that you're wearing is soooo pretty! Is it one of your creations? ooh your face is like a porcelain doll.... i wish i could try out this mask! We have the same skin type... I am super oily though! You can bake cookies on my face..UGH!! LOL... It's hard for me to believe you have oily face, it's freaking flawless! ooooooo hello beautiful :) i really like your signature.. and the round thing around it! haha. wow I guess it's good for bigheads too :D I'll go get my boyfriend some! LOL xD he really needs some TLC on his face :) thanks for the review! 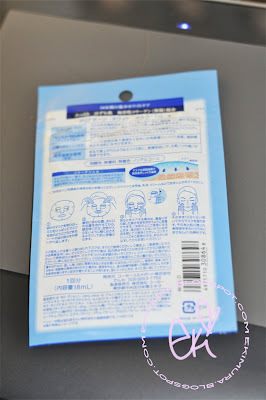 Thanks for the review :) This mask looks really good, I like how it's so thin! thanks for the review. i shall give it a try soon. ohh i think i used it before, thinking it was pretty good! thanks for sharing :D looking pretty there!! Your skin is sooo flawless!! I want to try that mask! Where did you buy it from? Thanks for the mask review. I think I have the pink packaging of that Kose mask (forgot what the name of it is). Your skin looks flawless as always! Oh very nice review, now maybe I shall one day try it too! i'm just jealous of your super nice skin!